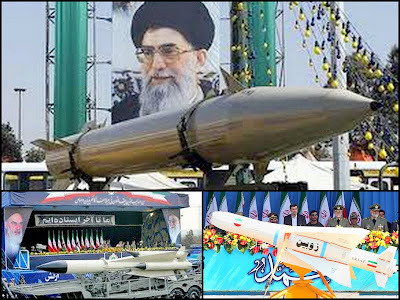 ArabSaga: Iran’s missiles: With or against the Arabs? Egypt-brokered talks to end a week of Israeli-Hamas violence continue. U.S. Secretary of State Hillary Clinton is heading to the region and the UN chief has once again appealed from Cairo for an immediate ceasefire. Grieving Gazans were today burying civilians killed in ongoing Israeli airstrikes, and barrages of rockets from Gaza sent terrified Israelis scurrying to take cover. The conflict began last Wednesday when Israel killed a top Hamas military commander, saying it wanted to end rocket attacks on its soil. Hamas lobbed rockets into Israeli cities, sparking off euphoria on Arab streets. For the first time, missiles were aimed at areas in Israel where the alarm siren was never heard before. Israel’s reach is not what it used to be – it can no more kill Arabs on a whim. The missiles flying from Gaza raised the Islamic Republic of Iran’s fame as their exclusive designer and manufacturer. And that’s exactly what the Islamic Republic is after – winning the Arab street, which is by nature emotive and easily enraptured by anyone trying to punish Israel for disgraceful transgressions. But there are Iranian missiles and bombs being used to kill other Arabs in Syrian villages, towns and cities. No one has yet explained why Iran’s military hardware is used to defend some Arabs in one place and kill other Arabs somewhere else at the same time without hurting their enemy. Iran basically plays to win. She wins loads when Arab public opinion deems her to the defender of downtrodden Palestinians, who are used as fodder for Israel’s killing machine. Iran helps kill Syrians trying to break free from the alliance she champions. At the same time, Iran’s cat’s-paw in Lebanon, Hezbollah, remains a Gaza bystander, saving its huge missile arsenal to fight Lebanese Arabs. The play is truly surreal. The play’s producer says the weapons should only be used when they serve their provider’s interests, i.e. Iran. Israel’s human and material losses from Iranian rockets in the weeklong violence are infinitesimal compared to the losses inflicted on the Syrian people. The Gaza conflict was also timed to be unkind to the new regime in Egypt. Whoever chose to pull the trigger meant to put Egypt on the spot by forcing it to choose between backing Palestinians on the ground or doing nothing, as Mubarak’s Egypt would have done. Cairo, it seems, chose to play the game. It sent its prime minister for a few hours to Gaza and followed up with plenty of verbiage about solidarity, support and brotherhood. But the end result is the same – an attempt to mediate between the two protagonists, as Hosni Mubarak used to do. The Arab League was probably more loud-mouthed this time, but nothing more. It allowed some people to extol the virtues of Iran’s weapons technology, especially after last month’s launch by Hezbollah of an Iranian-made drone over Israel, which was shot down by Israeli forces. It revived talk of Iran being the indisputable backer of Palestinians. It left in the shade a key accomplishment by the Syrian people who saw their opposition groups unite in a coalition in Doha and go on to win unprecedented international recognition. It boosted Prime Minister Benjamin Netanyahu’s reelection chances.